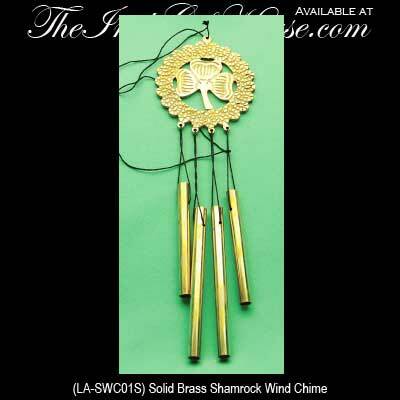 This Irish wind chime features a brass shamrock. This Irish wind chime features a solid brass shamrock medallion at the top along with dangling metal chimes. The shamrock wind chime measures 3" wide x 8 1/2" long, in total length; they are suitable for your garden. The Irish wind chimes are made in Ireland by Liffey Artefacts and they are gift boxed with a shamrock history card, complements of The Irish Gift House.